CDA presented some of its 2010 awards during ceremonies held in Ottawa in April 2011. The CDA Medal of Honour recognizes outstanding service, leadership and humanitarianism at the local, provincial, national and international levels. Dr. David Precious of Halifax, Nova Scotia, is just the second ever recipient of the CDA Medal of Honour. 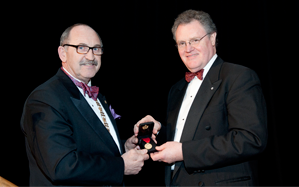 Dr. David Precious (r.) received his CDA Medal of Honour from Dr. Ronald Smith, CDA past-president. Dr. David Precious has dedicated his career to advancing the care of patients with dental and facial deformities in Canada and abroad. He has developed surgical techniques that have resulted in dramatic improvements for people with cleft lip and palate. Dr. Precious has received numerous awards and academic appointments and served as dean of dentistry at Dalhousie University from 2003 to 2008. According to one Dalhousie colleague, “David has pioneered much of what is now practised in oral and maxillofacial surgery, especially in the area of cleft lip and palate, not only in Canada but worldwide.” In recognition of his lifetime of work in treating cleft lip and palate patients in Canada and internationally, Dr. Precious was inducted as a Member of the Order of Canada in 2007. Within organized dentistry, he has served as president of the Nova Scotia Dental Association, president of the Canadian Association of Oral and Maxillofacial Surgeons, chief examiner in oral and maxillofacial surgery of the Royal College of Dentists of Canada for over 10 years and was a founding member of the International Cleft Lip and Palate Foundation. CDA’s Distinguished Service Award recognizes an individual who has made an outstanding contribution to the profession in a given year or over a number of years. This year, 3 recipients received this award: Dr. Donald Cunningham of Guelph, Ontario, Dr. Richard Ellen of Toronto, and Ms. Barbara Wishart of Fredericton. Dr. Donald Cunningham (l.) and Dr. Robert MacGregor, CDA president. Dr. Donald Cunningham joined the Dalhousie University faculty of dentistry as a pediatric dentist in 1970 and quickly became a positive role model for its dental students. He was a hands-on clinician with Dalhousie’s children’s outreach program which involves dental students providing treatment in rural Nova Scotia communities. Dr. Cunningham was very influential in the development of admissions instruments for student selection in Canada. He served as project director for the development of the Standardized National Behaviourally Based Interview for CDA. As a result of his work, the CDA Structured Interview was introduced as an admissions tool in dental schools in 2001 and continues to be used today. Dr. Cunningham was also involved in studies to assess the reliability and predictive validity of selection tools used in Canadian dental schools. From left: Dr. Lynn Tomkins, ODA president, Dr. Richard Ellen and Dr. David Mock, dean, University of Toronto faculty of dentistry. Dr. Richard Ellen has held various academic positions at the University of Toronto faculties of dentistry and medicine. He was instrumental in advancing the role of dentistry within the broader arena of health research in Canada. Dr. Ellen was a long-standing member of the Institute of Musculoskeletal Health and Arthritis of the Canadian Institutes of Health Research (CIHR). He also served as chair of the Institute’s Advisory Board, the only dentist to have chaired an advisory board of a CIHR Institute. His work at the University of Toronto led to the creation of the CIHR Strategic Training Program, Health Applications of Cell Signaling in Mucosal Inflammation and Pain. This internationally recognized training program has encouraged young clinicians across many disciplines to pursue careers in education and research. Dr. Ellen has also been very active in the International Association for Dental Research (IADR), including serving as the IADR Regional Board Member for North America and as president of the Canadian Association for Dental Research from 2002 to 2004. Ms. Barbara Wishart served as executive director of the New Brunswick Dental Society (NBDS) for over 20 years before retiring in 2010 from this position. She joined the NBDS after a long career in teaching. Ms. Wishart was a member of the original TriPartite Task Force—a group which recommended that CDA evolve toward a corporate membership model, where CDA would primarily serve the provincial dental associations as members, rather than directly serving individual dentists. Ms. Wishart was the first female executive director of a provincial dental association in Canada. In this role with the NBDS, she acted as a mentor to Dr. Deborah Stymiest of Fredericton, who was elected as the first female president of CDA in 2008. Ms. Wishart was unable to attend the award ceremony in April. The Special Friend of Canadian DentistryAward is given in appreciation for exemplary contribution to Canadian dentistry. Mr. Ken Dickson of the Aurum Group of Companies was presented with this year’s award. Mr. Ken Dickson (l.) and Dr. Ronald Smith. Mr. Ken Dickson has represented the Aurum Group of Companies in various capacities since he began as its national sales manager in 1986. Through his efforts and leadership, the Aurum Golf Tournaments have become a fixture at dental meetings across Canada. These events have raised significant amounts of funds for a variety of dental charities, including the Dentistry Canada Fund and Give Back A Smile. Mr. Dickson and the Aurum Group of Companies were recognized by CDA for their generous and steadfast commitment to the dental profession in Canada. CDA’s Honorary Membership award recognizes an individual who has made an outstanding contribution to the art and science of dentistry or to the profession over a sustained period of time. Dr. Johan Wolfaardt of Edmonton is this year’s recipient. Dr. Wolfaardt will be formally presented with his CDA Honorary Membership award in April 2012.